Robben: "We are really hungry"
Gelsenkirchen - Bayern Munich's perfect start to the season continued with a 2-0 win at Schalke - their seventh win in seven games in all competitions - and Arjen Robben explained how, after two years without a title, they are hungrier than ever for success. Speaking after the match, the Dutch wing wizard praised his side's strength in depth, and their winning mentality which he believes can take them a long way this season. 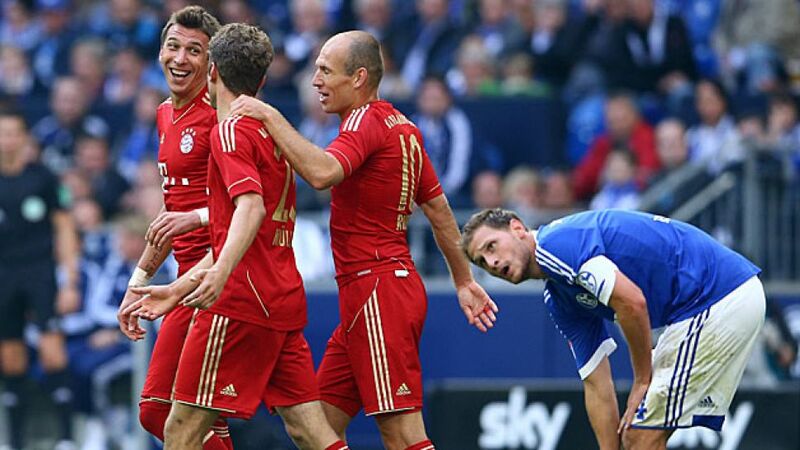 Question: Arjen Robben, congratulations for the win over Schalke. What was the key to this victory? Robben: We are just in great shape. Our organisation is spot on and we are creating many changes. It was tough to start with today against strong opponents who will certainly be challenging up there, but in the end, our quality made the difference. Question: Speaking of quality, was Franck Ribery not missed today? Robben: We are now able to cope better when players aren't available because we have more strength in depth than we had last season. Of course it is nice when this works right from the start of the season. Whether Franck has a small knock, or like I did last week, we are always able to compensate. That is important for everybody to know that even the key players can be replaced. We just have the quality to do that. Question: Has this extra strength in depth made the battle for places even greater? Robben: I think everybody sees this differently. Every player has a different way of dealing with it. I think that competition is aways good. Personally, though, I don't need another player biting at my heels in order for me to play to the best of my ability. I am too much of a professional for that. I always give 100 per cent anyway and try to improve myself all the time. Question: You spent a lot of the time out on the left against Schalke - is that now your preferred side? Robben: To be honest, I was everywhere today - left, right and down the middle. I think it is important to have freedom. Of course all of the positions need to be filled, but freedom is important. That is how you can create so much like today against Schalke. Question: Coach Jupp Heynckes made changes again compared to the Valencia game. How do the players respond to this rotation? Robben: I don't think that many changes are going to be made after every game. It is important that the team keeps its rhythm and can develop a good understanding. Question: Four games, four wins - are Bayern striding towards the title? Robben: Of course the title has been our aim right from the beginning. That is not going to change. Just because we are currently ahead of Dortmund does not mean we will automatically win the league. We have got to fight for every point and not let up. But it is important that we put together a winning streak, as we are doing. Question: Bayern appear to be very self-confident. How are things within the team? Robben: I had the feeling from the first day of pre-season that we are really hungry. The team wants to prove and achieve something. We have not won a title for two years now and that is not a nice feeling. We want to win titles. If things go as they are at the moment, then you really enjoy yourself out there on the field.